Sparkle?. 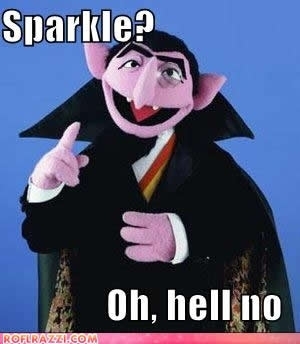 It doesn't seem like the Count likes Sparkles.... Wallpaper and background images in the Critical Analysis of Twilight club tagged: twilight funny sparkles sesame street. This Critical Analysis of Twilight photo might contain নকল মানুষের, কমিক বই, কমিকস, and কার্টুন. Vun, two, tree, tree sparkles! Mwa-ha-ha-ha-haa! HA! The Count could karate chop Edward's @$$ any day! And look at those spaghetti arms! The Count is pure epicness. Do you think it`s funny? By definition of a vampire, VOLDEMORT is more a vampire than Edward!